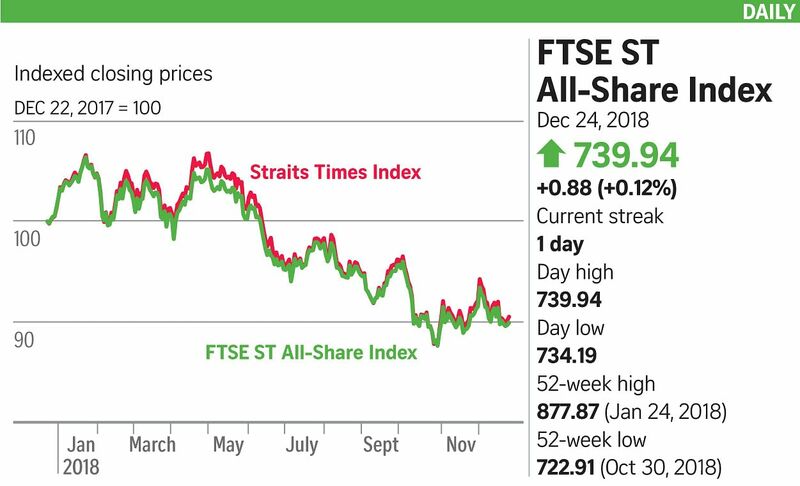 Holiday cheer was in short supply in the Singapore market yesterday, with the key Straits Times Index barely treading water in a mercifully shortened trading session before Christmas. The index closed the half-day Christmas Eve session just 0.16 per cent higher at 3,051.06, up 5.02 points from last Friday's close. Trading on the bourse was predictably thin, with 602.2 million shares worth $461.6 million changing hands. Losers outnumbered gainers 193 to 118. With news on other fronts in short supply, political instability and continued equity market losses in the US weighed heavily on investors' minds. US Treasury Secretary Steven Mnuchin added fuel to the fire on Sunday, calling top US bankers and making plans to convene a "Plunge Protection Team". The group was also convened in 2009 during the financial crisis. "Nothing says don't panic like saying 'I'm calling the plunge protection team tomorrow'," Mr Michael O'Rourke, JonesTrading's chief market strategist, told Bloomberg news. "That's the type of event that's going to startle markets and create more panic and fear when it's meant to create confidence." Over the weekend, Mr Mnuchin also tried to quell fears that President Donald Trump plans to fire Federal Reserve chairman Jerome Powell, after Bloomberg News reported Mr Trump had discussed the idea. Mr Stephen Davies, chief executive and co-founder of Javelin Wealth Management, told Bloomberg TV in Singapore: "It would be extremely damaging for the President to carry through on his vague inquiries about whether or not he can fire the head of the Federal Reserve. That will do market confidence no good whatsoever." In Singapore, CMC Markets analyst Margaret Yang noted that crude oil prices continued to fall, acting as a drag on the offshore and marine and banking sectors. "Before we see a turnaround in crude oil prices, those sectors are likely to remain fragile on profit and asset quality concerns." Several oil-linked counters fell in active trading yesterday, including the day's most heavily traded counter, Ezion Holdings. The offshore and marine company ended 2.3 per cent lower at 4.3 cents after 31.2 million shares were traded. Oil and gas plays Rex International and KrisEnergy were among the top ten active stocks, with Rex International ending 1.85 per cent lower at 5.3 cents, while KrisEnergy gave up 3.95 per cent to close at 7.3 cents.